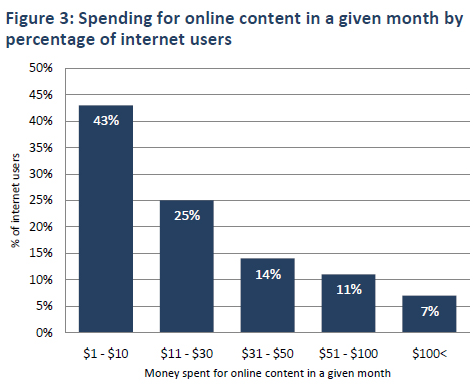 A New Pew Survey says at least 65% of web users actually pay for online content. My rock band has leapt across treadmills, camouflaged ourselves in wallpaper, performed with the Notre Dame marching band, danced with a dozen trained dogs, made an animation with 2,300 pieces of toast, crammed a day-long continuous shot into 4½ minutes and built the first ever Rube Goldberg machine—at least that we know of—to operate in time to music. We are known for our music videos, which we make with the same passion and perseverance we do our songs. Our videos have combined views in excess of 120 million on YouTube alone, with countless millions more from television and repostings all over the Internet. The band OK Go is no stranger to viral video success, with combined views in excess of 125 million on YouTube alone. Lead singer Damian Kulush explains how video works into the band’s strategy. For most people, the obvious question is: Has this helped sell records? The quick answer is yes. We’ve sold more than 600,000 records over the last decade. But the more relevant answer is that doesn’t really matter. A half a million records is nothing to shake a stick at, but it’s the online statistics that set the tone of our business and, ultimately, the size of our income. We once relied on investment and support from a major label. Now we make a comparable living raising money directly from fans and through licensing and sponsorship. Our bank accounts don’t rival Lady Gaga’s, but we’ve got more creative freedom than we did as small fish in her pond. Then came the Internet, and in less than a decade, that system fell. With uncontrollable and infinite duplication and distribution of recordings, selling records suddenly became a lot like selling apples to people who live in orchards. In 1999, global record sales totaled $26.9 billion; in 2009, that figure, including digital purchases, which now represent 25% of sales (nearly 50% in the U.S.), is down to $17 billion. For eight of the last 10 years, the decline in revenue from record sales has gotten steeper, which is to say the business is imploding with increasing vigor. Music is getting harder to define again. It’s becoming more of an experience and less of an object. Without records as clearly delineated receptacles of value, last century’s rules—both industrial and creative—are out the window. For those who can find an audience or a paycheck outside the traditional system, this can mean blessed freedom from the music industry’s gatekeepers. Georgia singer/songwriter Corey Smith has never had a traditional record contract, but in 2008 he grossed about $4 million from touring, merchandise and other revenue, yielding roughly $2 million that was reinvested in the singer’s business, according to his manager, Marty Winsch. Mr. Smith makes his recordings downloadable at no cost from his website, and Mr. Winsch emphasizes that they are promotion for his live shows, not the other way around. “We don’t look at it as ‘free,’ ” he says. “When people come to the website and download the music, they’re giving us their time, their most valuable commodity.” Recently, Mr. Smith entered a partnership with a small music company, but unlike a traditional label deal, the arrangement will give him 50% of any net revenue. Mr. Smith’s touring success, unfortunately, isn’t indicative of industry trends. Live performance, once seen as the last great hope of the music industry, now looks like anything but. Live Nation, the largest concert promoter in the U.S., recently reported that concert revenue is down 14.5% since last year. A report by Edison Research found that in 2010, 12-to-24-year-olds went to fewer than half as many concerts as they did in 2000; nearly two-thirds went to none at all. So if vanishing record revenue isn’t being replaced by touring income, how are musicians feeding themselves? For moderately well established artists, the answer is increasingly corporate sponsorship and licensing—a return, in a sense, to the centuries-old logic of patronage. In 1995, it was rare for musicians to partner with corporations; in most corners of the music industry, it was seen as the ultimate sell-out. But with investments from labels harder to come by, attitudes towards outside corporate deals have changed. These days, money coming from a record label often comes with more embedded creative restrictions than the marketing dollars of other industries. A record label typically measures success in number of records sold. Outside sponsors, by contrast, tend to take a broader view of success. The measuring stick could be mentions in the press, traffic to a website, email addresses collected or views of online videos. Artists have meaningful, direct, and emotional access to our fans, and at a time when capturing the public’s attention is increasingly difficult for the army of competing marketers, that access is a big asset. My band parted ways with the record label EMI a little less than a year ago. While we were profitable for them, our margins were smaller than those of more traditionally successful bands, because our YouTube views don’t directly generate as much revenue as record sales. Our idea of what constitutes success and how to wring income out of it eventually wound up too far apart from EMI’s. We’re not the only ones working with brands. Corporate sponsorship of music and musical events in North America will exceed $1 billion in 2010, up from $575 million in 2003, according to William Chipps, author of the IEG Sponsorship Report, a Chicago-based newsletter that tracks and analyzes corporate sponsorship. By comparison, the U.K. music licensing organization PPL reports that record companies’ global annual investment in developing and marketing artists stands at $5 billion. The numbers measure slightly different parts of the industry, but from an artist’s standpoint, one thing is clear: Outside corporate investment in music is rapidly climbing into the range of the traditional labels’. Still, this model isn’t much use to unknown bands, since companies tend to bet their marketing money on the already established. This brings us to one part of the old record industry that no one seems to know how to replace: the bank. Even in the halcyon days, profitable labels were only successful with about 5% of their artists. Contracts were heavily tilted in favor of labels, so that the huge profits on the few successes paid for the legions of failures. Labels aggregated the music industry’s high risks. Even if there are newer, more efficient models for distribution and promotion in the digital era, there aren’t many new models for startup investment. What Killola is learning is that making a living in music isn’t just about selling studio recordings anymore. It’s about selling the whole package: themselves. And there are plenty of pioneers leading the way. Top-shelf studio drummer Josh Freese sold his album online with a suite of add-ons. For $250, fans could have lunch with him at P.F. Chang’s; he says the 25 slots he offered sold out in a day. One fan sprung for the $20,000 option, which included a miniature golf outing with Mr. Freese and his friends. Singer Amanda Palmer made over $6,000 in three hours—without leaving her apartment—by personally auctioning off souvenirs from tours and video shoots. The New Orleans trombone rock band Bonerama advertises online that they’ll play a show in your home for $10,000. Not every musician takes the project of selling themselves literally, but the personality and personal lives of musicians are being more openly recognized as valuable assets. The Twitter account of rapper 50 Cent arguably has wider reach than his last album did, and Kanye West has made an art form out of existing in the public eye, holding spontaneous online press conferences and posting rambling blog entries. This isn’t so revolutionary an idea. Pop music has always been a bigger canvas than beats, chords and lyrics alone. In his early days, Elvis’s hips were as famous as his voice, and Jimi Hendrix’s lighter fluid is as memorable as any of his riffs, but back then the only yardstick to quantify success was the Billboard charts. Now we are untethered from the studio recording as our singular medium, and we measure in Facebook fans, website hits, and—lucky for me—YouTube views. —Mr. Kulash is the lead singer and guitarist for OK Go. As record sales continue to decline, some bands are finding alternate routes to success. Here are some guidelines for the new music landscape. Some bands are finding alternate routes to success by tapping into the app market or reinventing the music video. Apps could be the new albums. Many bands, from Phish to rapper T-Pain, have developed their own apps, which fans download to their smartphones, typically for less than a dollar. With features such as remixing tools and games, apps can offer bands a deeper connection to their fans. Developer RjDj makes apps that pick up noises through a phone’s microphone and weaves them into the music, promising a new version on each listen. The company has created apps for the U.K. rock group Clinic and the film “Inception” and its Hans Zimmer score. Fans don’t just buy records, they make donations. Via a crop of sites such as PledgeMusic and ArtistShare, acts are soliciting donations directly from fans for tours and recording projects, offering donors access and clever swag. Recently on Kickstarter.com, a Las Vegas “lounge legend” named Richard Cheese raised more than $21,000 to make an album called “Let It Brie.” He promised to thank donors of $250 by name on the record. A clever music-video concept can be a band’s best marketing tool, and savvy acts apply their creativity to their videos as well as their albums. For its song “We Used to Wait,” the indie-rock band Arcade Fire collaborated with Google Web developers to create an online video that incorporated customized maps of the viewer’s hometown into a dreamscape that spilled across multiple browser windows. Pomplamoose, a San Francisco guy-girl duo, has a repertoire of its own endearingly warm pop songs and videos, but it was their homespun versions of hits by Beyoncé, Lady Gaga and Michael Jackson that raked in millions of views on YouTube. Then the group broke into the mainstream with another set of covers: performing holiday tunes such as “Deck the Halls” in TV ads for Hyundai. I have basically two jobs these days. One is writing SEO stuff, basically fluff content to push businesses’ search rankings up higher. It’s a modern-day Greek parable about trying to fill the bottomless hole. The other job is dog-walking, which means acting as a sort of modern-day Victorian governess for another species. In the one job I pick up crap; in the other I lay it down. For better or worse, both of these jobs may someday become obsolete — because of better machines. This I came to realize over the three days Jaron Lanier was visiting USC. Lanier is called an “internet guru” and “the father of virtual reality” — and while it’s clear that he was present through the rough adolescence of the internet, he’d have you believe that he was its midwife. Lanier was at USC as Annenberg’s “Innovator in Residence.” He talked to classes, sat in on round-table discussions, stirred a variety of pots in his half-week at the school. Lanier lives in Berkeley and looks like it — a big guy with a beard and dreadlocks, a collection of exotic instruments, and a steady supply of black t-shirts. He’s sold a company to Google and studied cephalopod intelligence and the connection between language and the sense of smell. He thinks my jobs are on the way out because we’re building machines that will do more and more stuff for us. This idea isn’t new, of course. As Lanier explained during his visit, Karl Marx imagined a world where machines would give us limitless free time, while sci-fi guys like H.G. Wells fretted that machines would make us obsolete and eventually either destroy us or split us into the “haves” and the “underground mutant cannibals.” E.M. Forster rounds out Lanier’s menage a dystopia with a story called “The Machine Stops,” in which we become dependent on our technology until it fails us and we’re forced to once again discover truth in nature, in the original processes of the world. Lanier believes Forster’s version of technology is closest to what’s happening to us, but disagrees that rejecting technology is the way to truth. He’s in an interesting position to argue this, interesting because he claims responsibility for developing the many online evils that he is now trying to save us from. In his meetings with classes and faculty, he was able to be on both sides of the argument. Case in point: He writes about those days of developing VR with his friends and thinking they were sitting in “the most interesting room in the world.” He also frames his objections to the free exchange model of the internet by disclosing that he was the guy who came up with that theory in the first place, when he was young and foolish. It’s hard to frame a debate around a subject who occupies every side — like arguing with funhouse mirrors. But he made it clear in those three days at USC how essential a discussion of ideas is in developing a culture. Often he proved this necessity by avoiding discussion altogether. It’s fair to say that he does have plenty of ideas to discuss. He’s written about the origin and fate of the internet in columns for Discover magazine, articles for The New York Times, and a lot of panel discussions. His prolific output has all been finally sort of corralled in a book, You Are Not a Gadget. This book is called a “manifesto” and reads as such. It’s personal and fascinating and self-indulgent, often to the point of solipsism. But it is a valuable piece of work on our internet culture — where it came from, where it might be going, where it could be going better. Lanier’s a humanist at heart, and his rebellion is aimed at those entities we all love the most. He believes the internet’s masters, corporate monsters like Google and Facebook and the hedge-fund systems that caused so much financial crisis make us expect less out of other people as real-live human beings. The internet masters reduce our expectations of one another by controlling our access to other people and to the web at large. He also believes that the current design of the internet encourages simplification of people and supports foolish, socialist notions of communal ownership. All of which means, in the spirit of any good sci-fi dystopia, that we’re dehumanizing ourselves to the point of ruin, just as we’re trying to make a working economy out of the internet. He argues that the internet got to be where it is because of some early design decisions that seemed easy at the time, but that got locked-in as other software came to depend on it. Meaning we were stuck with designs that may not have been the best of all possible worlds. Really basic stuff like the way we type line-item entries into Google searches, for example, are vestigial tails of earlier programming designs. His solution is adapted from an earlier internet guru, a Jaron 1.0 named Ted Nelson. Nelson’s idea of an internet, from way back in 1960, was for a system that had only one copy of any file, whether it be music or art or a poem or whatever. And that its creator had control of it, and could give it away or rent it out or whatever, but that you would always return to the source if you wanted to experience it. It retained, as Lanier says, its provenance. And that keeps things honest, trackable. Lanier’s expansion involves everyone having their own universal account allowing them to buy, sell, or rent on their own. A marketplace, he thinks, will arise, where commerce will be equal and dispersed and democratic and profitable for everybody, not just those Googles and Facebooks who make their money as advertising hubs. His other great staple of sci-fi dystopia is that those two powerhouses make their money by spying on we, the users. Every search we make, everything we buy, the casual content of every Gmail we send, all gets absorbed and processed and used to create a profile of us. And it’s that profile that is used to determine what kinds of ads we see alongside our search results, or to determine what kinds of new friends are being recommended to us. We’re being corralled, Lanier says again and again, and I for one totally share his latent paranoia. I’ve gotten a lot of ads on my various pages lately for New Balance and messenger bags, stuff I recently bought online. It’s like walking through Times Square and having every one of those giant screens projecting your deepest, most innermost personal feelings on pants and burritos right back at you. The solipsism is contagious. So we get put in boxes to make it easier for advertisers to find their ideal audiences, and Google and Facebook make all the money. Meanwhile we’re giving everything away for free, all our ideas and creations, to be replicated and copied and mashed up. To crib from a certain sci-fi classic: He who controls the servers controls the universe. But how to take control of the internet? How to convince someone to suddenly start paying for what they’re getting for free? Here Lanier rests his argument on some shaky sociological ground. His secret weapon to make the shift to true internet capitalism is the Golden Rule: you won’t take things for free online because you, too, rely on the internet for your weekly nickels. There is something to this idea of provenance, though; that is, the ability to track a file back to its source, and therefore to see it in its original context (with, presumably, its one and only owner). Lanier thinks this arrangement keeps things simple, straightforward, and prevents what he calls “artificial mysteriousness” (this is the phenomenon of things being more obscure than they need to be, e.g. relying on recommendation engines such as Netflix’s to help you make choices, when, he argues, most of the time we don’t need the help). If one person controlled all the art they made (those “files” of the songs and paintings and poems they labored over), and it could be made impossible to replicate those files but also easy for an interested party to find those files and pay, say, a few pennies each time they want to listen to that song or read that poem, then you might be able to have a really robust economy online. But first you’d have to convince people that paying a few cents is somehow better than paying nothing at all. The problem is that the Golden Rule was conceived when all behavior was in person — you had to be nice to someone’s face. Or throw a stone in it. But with file-sharing it’s basically victimless, at least as far as our immediate experience is concerned. It’s an abstraction that costs nothing to replicate and hurts no one (that we can see). Maybe if we knew that a puppy would be drowned every time we downloaded a new Coldplay album, it would change our behavior, but in the world of abstraction that is the internet, the Golden Rule is an unrealistic principle. It’s not always realistic in the real world either: corruption exists at every level of interpersonal relationships and business and government. So how are we supposed to apply this humanistic principle to a medium that Lanier himself admits is dehumanized and dehumanizing? His vision is appealing, especially to those of us in journalism and music who are what he calls the canaries in the coal mine — the first to feel the impoverishing effects of internet technology. (Coal miners, I would note, still have jobs these days. As do canaries.) But to build an internet culture upon a platform of basic decency and consideration forgets that that’s not how people are. Which is why: laws, government, locks on doors. His fears about the easy replication and manipulation of files is on the one hand understandable and on the other sort of naive. Yes, the ceaseless replication of files contributes to 1) a massive carbon footprint, since he estimates that half the internet is taken up with replicated movie files, and 2) the loss of provenance, of origin. And yes, replication and loss of provenance not only devalues the original thing but also makes it hard to find. Things get so scrambled up in there that search engines can come in and regulate our access to the stuff that’s out there, while monitizing the reorganization of information. But, interestingly, that abundance of information — whether for listening or reading or collecting — also sets up the conditions whereby creative phenomena like mash-ups are possible. Which many people love. Lanier not being one of them. “Anonymous blog comments, vapid video pranks, and lightweight mashups may seem trivial and harmless,” he writes in his book, “but as a whole, this widespread practice of fragmentary, impersonal communication has demeaned interpersonal interaction. Lanier feels the mash-up has cheapened art, the last decade’s stale content proving that the internet is bad for art, as there has been a near-total reduction, in his opinion, of true novelty and originality. There’s no doubt that there’s a lot of crap being produced; I’m one of its producers. But it’s perhaps a stretch to say that an internet or collective culture is killing expression. Jonathan Lethem wrote an essay for Harper’s in 2007, “The Ecstasy of Influence: A Plagiarism,” in which he argues that the obsession with originality and ownership of ideas ultimately hurts artistic expression overall. He does this by constructing an essay entirely out of fragments of other people’s writings, changing and smashing and blending it where necessary (and crediting the authors at the end). One of his borrowed sources is USC’s own Provost Professor of Communication, Journalism and Cinematic Arts — Henry Jenkins. Jenkins believes in the interactive potential of the internet to create new and neat stuff. We can think about this idea of creativity-as-dialogue in the context of Lanier’s visit itself. He gave many talks over the course of his USC visits, repeating basically the same message, often with the exact same phrases, over and over again — with some variations depending on whether the audience was an arts journalism class or an assembly of neuroscience students. Think of that basic talk as a file. If his ideal of the one-file internet were applied to the real world, he wouldn’t have sat in those classes and meetings. He’d have just given one talk, one time, to everybody. (Probably this would seem appealing after three days of small group visits.) But there wouldn’t have been the same kinds of discussions generated. Though his message was always pretty much the same, the outcome was made different by the different people who heard it and took it and ran with it. Each copy of his file was reworked and made into many different ideas, some intersecting, some diverging, but all in all probably more valuable to all of us than one big hypothetical lecture. It’s pretty hard to say where exactly the reworking of ideas stops being a natural evolutionary force for creativity and becomes mindless, uninspired plagiarism. All new music, for example, is based on some style or technique or philosophy that came before. It takes that inspired moment to build something new on top of something old — rock evolving from blues, for example. And that feels different from someone taking some bits of Beethoven and putting them together in some loose new arrangement and calling it creation. Maybe true creativity can only be determined by some measure of inspiration, for which there is no proper scale at this time. Lanier is himself a musician, fascinated especially with really old instruments. He plays a lot of instruments, and composes as well. He played this Laotian mouth organ called a khaen during a demonstration on his second day, and he didn’t seem to acknowledge that making new music from an old instrument is perhaps no different than making a dance song out of reworked world music. It’s always about one person deriving something new from a previously existing collective, and maybe it’s up to the collective to determine the value of the thing created. Now whether this abundance of stuff blooping and bleeping around the internet will get smart on its own is another question. There are techno-theoristswho believe the internet will someday generate a critical mass and become not only organized but also super-intelligent, a phenomenon author Ray Kurzweil has called the Singularity. That many people have adopted this as a nearly spiritual belief drives Lanier batty. He thinks it represents a cheapening of those values that make humans special. That in breaking ourselves down into categories that Facebook algorithms can easily digest, we are also lowering our standards for being human. This is a pretty good place to leave off, I think — with some big metaphysical thoughts to kick around. Will machines someday regulate the ebb and flow of crap for me? It seems pretty likely that the internet will outsmart the SEOs and that a dog-walking robot will on a future afternoon post clever geo-tracked messages at every fireplug. Which pretty much leaves me to chew on all this other stuff, and decide, along with the rest of us, collectively you might say, what kind of technological world we’re giving ourselves. Lanier reminds us that it doesn’t have to be as it is. Whatever we come up with, we better ensure a lot of good participation from as many people as possible. It’s like the man said: If calculus had more perversions, there’d be a lot more people taking math. 1. The length of time an artist can hold a copyright, as just one example, maintains a different kind of “walled garden” around a work, preventing other artists from building on those ideas. It ensures that the artist makes money off that IP, but, Lethem suggests, stagnates the flow of a kind of creative economy. There’s maybe something to this, and it’s easy enough to prove: Look at how works that fall into the public domain are treated. Jane Austen’s canon alone maintains steady sales even 200 years later (there are something like more than 100 versions of Pride and Prejudice in print now), while inspiring other work. Bridget Jones’ Diary owes its existence to Austen, as does, much more literally, the mash-up novels Pride and Prejudice and Zombies and Sense and Sensibility and Sea Monsters. Not only were these monster parody books hugely successful, but (to offer some comfort to Lanier’s fear of a loss of provenance), there’s evidence that the zombie book, at least, bumped sales for Austen books in general — proving people will follow a mash-up to its source. Has digital conversion reached a saturation point? Is Video Killing the Concert Vibe? Mobile technology, participatory culture, and the future of music. Why Apple’s Ping is about cutting out the social middleman from VentureBeat.